Jensen Transformers has introduced two new instrument oriented DI boxes, the mono Concert-1 and stereo Concert-2. 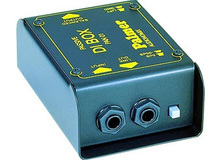 dbx introduces the DJdi, a dual channel passive DI box. Radial Engineering has announced the BT-Pro Bluetooth DI box is now shipping. A-Designs has presented the Reddi V2, a rack-mountable version of their Reddi all-tube DI unit. Radial Engineering revamped its popular JDX DI box for guitar/bass amps so that it can be phantom powered. Radial Engineering announces the availability of the stereo version of its JDI passive direct box. Radial Engineering announces a stereo version of its J48 active direct box, which is phantom powered. Radial Engineering announces the availability of the new Trim-Two stereo passive direct box/isolator equipped with a volume control.